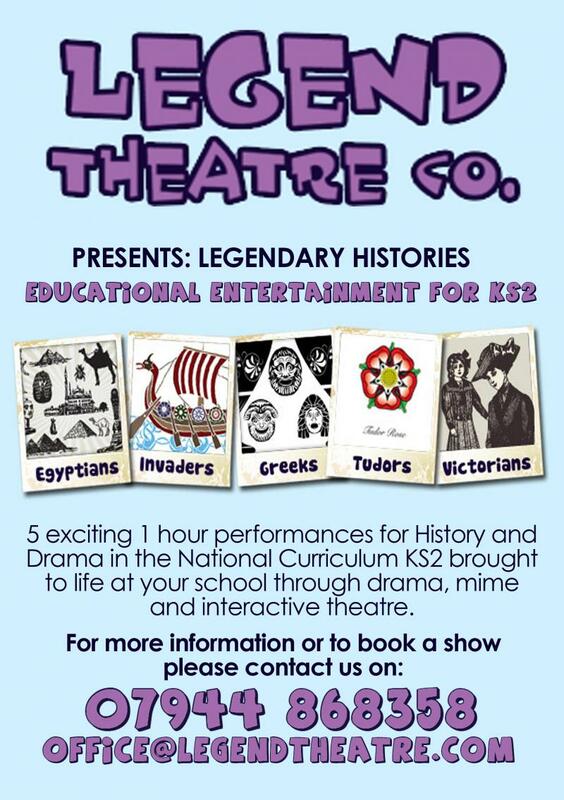 LEGEND THEATRE COMPANY for History and Drama in the National Curriculum KS2 brought to life at your school, through drama, mime and interactive theatre. Legend Theatre uses a team of enthusiastic professional CRB/Equity actors. Allowing flexability in choice of dates and productions. Afternoon workshops available to expand on shows information and skills. Audience participation and role-playing children onstage. Productions are based around 5 popular historical periods relevant to keystage 1 & 2 and the National Curriculum. "I just wanted to say a big thank you, on behalf of the year 4 team at Frimley C of E Junior School, for last Thursday. The children loved it! " workshop. We will definitely be recommending the company to others."